FILE - Greek Prime Minister Alexis Tsipras delivers a speech from the western Greek island of Ithaca, Aug. 21, 2018. Greek Prime Minister Alexis Tsipras heads to Ankara Tuesday in the latest effort to improve relations with regional rival Turkey. "The conditions must be created in Greek-Turkish relations for historic steps to take place," Tsipras said in an interview with a Turkish news agency. Territorial and historical disputes have hurt ties, and pushed the two NATO members to the brink of war on more than one occasion. Tsipras will be hosted by Turkish President Recep Tayyip Erdogan in the capital Ankara. The two leaders have developed a working relationship that has underpinned rapprochement efforts. "They are worlds apart. Tsipras is a very secular politician, whereas Erdogan is a very deeply religious. Therefore, their world views will in the end inevitably clash," said international relations professor Serhat Guvenc of Istanbul's Kadir Has University. "What brings them together is not a lasting reason, but temporarily, because they are dealing with similar problems at home, which brings a shared sympathy for one another," Guvenc added. "Respect, honesty and directness," Tsipras said in explaining his relationship with Erdogan, adding that it is "challenged in very difficult moments." FILE - Greece's Prime Minister Alexis Tsipras, right, talks during a joint news conference with Turkey's President Recep Tayyip Erdogan at Maximos Mansion in Athens, Dec. 7, 2017. Controversy flared the last time the two leaders met, during Erdogan's 2017 December visit to Athens. The Turkish president publicly challenged Tsipras' government over a series of bilateral and historical disputes. However, analyst Guvenc believes shared interests will mean Tsipras' Ankara visit is likely to pass without controversy. "The two leaders have elections ahead in a couple of months, they need to make sure that while they are busy with other problems, Turkish-Greek relations don't go through yet another round of crisis," Guvenc said. Turkey is due to hold key local polls in March, and Greece heads to general elections in October. 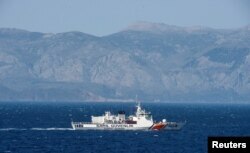 Bilateral tensions have recently started to rise over ongoing territorial disputes on the Aegean Sea, which divides the two countries. Turkish and Greek navies and air forces regularly challenge one another. "Tsipras will propose to Turkey a moratorium on the mutual incursions in the Aegean be it the sea or airspace," said political scientist Cengiz Aktar of Athens University. "A six- to 12-month moratorium on these continual clashes and dogfights will be proposed." Aktar says the Greek leader will likely address another point of tension with Ankara. "Tsipras will inform Erdogan that Athens will not extend to 12 miles Greek sovereignty in the Aegean Sea or around the island of Crete. Both Russia and the U.S. have encouraged Greece not to go ahead with this move." FILE - A Turkish coast guard ship patrols in the Aegean Sea, off the Turkish coast, April 20, 2016. Ankara warns such a move would effectively close the Aegean Sea to Turkish shipping and be a cause for war. Analysts point out that Moscow is playing a more active role in the eastern Mediterranean. "Moscow is like the United States and they all playing with what they have," Aktar said. "They want to be present in the region." Russian President Vladimir Putin has developed close ties with both Tsipras and Erdogan. "Of course, both [Erdogan and Tsipras] having good relations with Moscow is a big help for Russia," said Guvenc. "But I don't think Russia does enjoy a direct effect on relations between the two countries." Tsipras and Erdogan also share common ground in supporting the beleaguered Venezuelan President Nikolas Maduro. However, significant differences still exist between the two leaders. The Mediterranean Island of Cyprus divided between Turkish and Greek Cypriot communities remains a point of tension. Analysts warn the fate of Cyprus remains in the balance between a permanent partition and hopes of reunification. 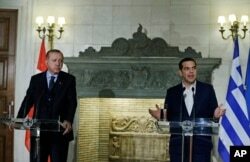 Tsipras is expected to discuss with Erdogan a dispute over energy exploration rights between the Cypriot communities. The Greek premier will be also likely to be looking to Erdogan for a commitment to continue with an EU agreement to control refugees crossing the Aegean to Greece. "As a result [of the deal], illegal flows and especially deaths in the Aegean, drastically decreased," Tsipras said ahead of his Ankara visit. 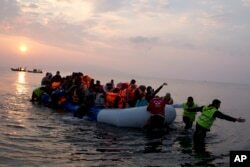 FILE - Volunteers help migrants and refugees on a dingy as they arrive at the shore of the northeastern Greek island of Lesbos, after crossing the Aegean Sea from Turkey, March 20, 2016. "I believe that Turkey has taken over the great burden of hosting four million refugees. That should always be recognized by the international community, and the EU should do all it can to support our neighbor," the Greek premier added. Ankara regularly accuses Brussels of failing to honor its side of the 2016 refugee agreement. Turkey's relations have soured with the EU, as its membership bid had all but ended amid growing human rights concerns. Turkey's membership bid was initially the impetus to Ankara improving relations with EU member Greece. Analyst Guvenc says, at least for now, mutual interests are sustaining the rapprochement. "That the rapprochement has survived so long is a surprise to me because they [Ankara] have not walked out of the cooperation despite the absence of the EU carrot. The so-called rapprochement has not turned into a detente or a lasting process of the stability and peace between the two countries. But in the meantime, the two sides have learned to reap the benefits of the rapprochement, for now," Guvenc said.